The next time someone asks me "Do you own a yarn shop?" I'll reply: "Nope. Couldn't deal with inventory." Spent yesterday gainfully employed from sunup to sundown counting skeins of yarn, needlepoint yarn, canvasses… generally aiding and abetting the gruelling process of ripping a perfectly beautiful yarn store apart and trying to put it back together again in a day. When it looked like we had things enough under control that I could come home on the last bus, I called Boyhood with the good news … only to get a subdued, not to say mixed, response. Was he planning a night out on the town with the boys? Wild pool party with nubile young maidens? Or even a wee game of poker? You see, he thought he had a day and a half to get a house project done, one that we've been sketching and planning for a few weeks. So my homecoming was met with a cascading series of events, that has to start in the living room. Q: Karen, do you always deposit vast piles of clean laundry on your dining table? Q: Why the sudden rush on the large appliances? To wash the cushions to the sleeper couch. Q: Really? The sleeper couch? Q: You slept on your own sleeper couch last night? 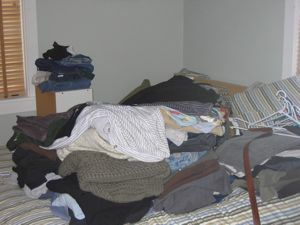 Q: Why on earth would you throw all the clothes you own onto the bed? Q: The closet? It was offending you in some way? * This is what happens when you live with a contractor/retired cabinetmaker.